Previous ed. : London: David Fulton, 2005. Teaching Assistants are uniquely placed to support children's involvement with learning. The role of those who work alongside teachers in the classroom has changed dramatically in recent years and teaching assistants are increasingly involved in planning, teaching and assessing all aspects of the curriculum. This second edition has been thoroughly updated and includes new chapters on learning in gardens, children's play in virtual environments, specialist approaches for children with communication difficulties, the nature of learning at home, the place of poetry, child abuse, learning in a breakfast club, children's spelling, and the importance of playtime. 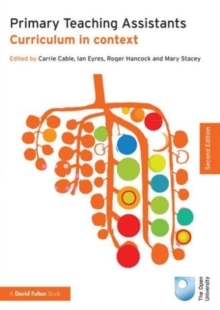 Exploring the issues that are central to fostering children's learning, the book examines:strategies for supporting learning and assessment in English, maths and scienceinclusive and imaginative practices in all areas of learninghome and community contexts for learningworking practices which support professional development. Written for teaching assistants and also teachers, the book aims to enrich the contribution that teaching assistants, as team members, can make to children's learning.